Economic development occurs with the expansion of the economic base of a community, region, state, or nation through the efficient allocation and use of available resources. In general, economic development is any activity that results in additional jobs and income. Economic development suggests an improvement in the quality of life for a community. Water is the basis for much economic development and industry, transportation, and energy production. It is also fundamental to agriculture, forestry, recreation, and the environment . Water has influenced where people live, as is evident by the location of many major cities and towns along or near sources of water. Water resources are a vital and underlying component of economic development efforts. As established under the Water Resources Planning Act of 1965, the "Principles and Standards for Planning Water and Related Land Resources" was published in 1973. Although repealed in 1982, the principles remain an important part of water resource planning. Of the two main objectives of the "Principles and Standards," one was "to enhance national economic development by increasing the value of the nation's output of goods and services and improving economic efficiency." Water is a key component in local, regional, and national economic development. 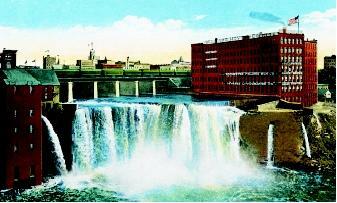 A postcard from the early twentieth century illustrates the historical siting of factories and urban centers near a steady water-supply source: in this case, the Genesee River (and its upper falls), New York. dredging, building canals such as the St. Lawrence and Erie, and opening the western United States to development. The next 25 years saw projects on flood control and irrigation spring up throughout the country to aid in the development of the nation's growing economy. Numerous federal agencies, such as the U.S. Army Corps of Engineers and the Bureau of Reclamation, were established in the early 1900s to make water resources available for development purposes. Large water projects, such as Hoover Dam (1936), not only contributed to the economic resources of a region but also provided much-needed public works employment during times of economic downturn. Increasing financial aid received from other government levels. Communities seek to keep money spent on goods and services within the community and prevent "leakage" of income. Water resources, especially recreational ones, can keep income in a community and attract spending from those outside the area. Existing firms seeking to expand the creation of new jobs and additional income often rely on the availability and high quality of water resources in their production process. New businesses need support in terms of water resources to help the formation of local opportunities. New businesses and industry often are attracted to a community when water supply and quality are high. Finally, state and federal spending on water projects can provide employment and income opportunities for local areas. SEE ALSO Army Corps of Engineers, U.S. ; Bureau of Reclamation, U.S. ; Canals ; Cost-Benefit Analysis ; Dams ; Hydroelectric Power ; Irrigation Management ; Land-Use Planning ; Planning and Management, History of Water Resources ; Supply Development ; Sustainable Development ; Tennessee Valley Authority ; Transportation ; Uses of Water . Pulver, Glen C. "Economic Growth in Rural America." In New Dimensions in Rural Policy: Building upon Our Heritage. Studies prepared for the use of the Subcommittee on Agriculture and Transportation of the Joint Economic Committee Congress of the United States, 99th Congress, 2nd session, June 5, 1986. Woods, Mike D., V. Jack Frye, and Stanley R. Ralstin. "Blueprints for Your Community's Future: Creating a Strategic Plan for Local Community Development." Oklahoma State University Extension Facts, WF-916, 1996.